Made with whole grain oat flour. Use Gluten-free oat flour if needed but note that there is no such thing as truly Gluten-free oat flour. Oats still have gluten, just not the same gluten as in wheat, barley and rye. See The Gluten Free Society’s article here. Used as a rare treat, oat flour might be just fine but that certainly depends on the individual. If you can tolerate oat flour than you may appreciate this recipe. 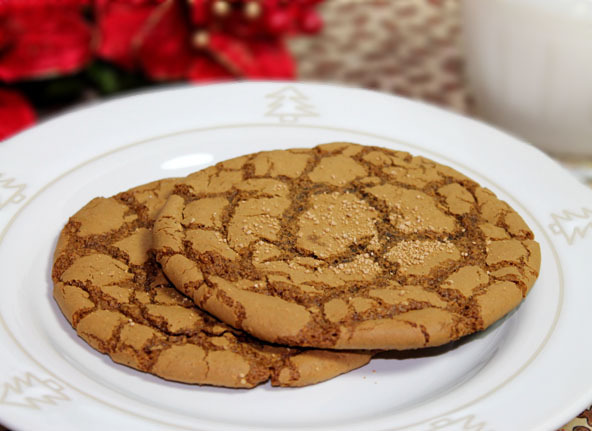 These delicious molasses gingerbread cookies are especially good to make for the Christmas Holidays. They bring back special memories for many and make great gifts. My Dad had a just a few things he liked to make and they were: whole wheat bread, chili, and molasses cookies. These were his comfort food specialties and just the thought of them brings back fond warm memories of my childhood with my dear ol’ Dad. I thought I should have a Wholetarian version of Molasses cookies just for that special occasion. So, here is the recipe I came up with. I was surprised at how much my kids liked them. I think I’ll make them again for Christmas in memory of my Dad. In a mixing bowl add coconut oil and or butter, wSugar of choice, molasses and eggs. Use beaters and cream together well until fluffy. Then add in the oat flour, sea salt, baking soda, cinnamon, cloves and ginger. Blend again until well incorporated. Stir in the chopped pecans if using. Prepare a cookie sheet with a thin layer of coconut oil. Use a 1¼" ice cream scooper to make small balls and roll in wSugar or place balls on the cookie sheet and sprinkle with wSugar.